My clock my body clock is Kaput! I am so whacked out from sleeping in and staying up late. I printed a few things, I made some notes, I read for an hour on The Hunger Games, colored an awesome picture of Iron Man, if I do say so myself- and I do! So I started finding cutesy crochet stuff- these coffee cozies are new to me...but apparently they cut down on the paper that will be thrown away, because these can be washed. - guess, left or right? It is the one on the left with two flowers! It is just too stinking cute! We are supposed to have a baby tomorrow- for a few hours.... can't wait til she gets here- the boys have a blast around babies. They are worse than new moms "Oh, look at that! Did you see what she did? " My sister had a ring tone on her phone that was a baby just cackling! It made anyone who listened to it laugh too. My oldest son liked it the most. He very thoughtfully said, :"Baby Laughs are what you hear when you know your heart is happy"
I bid you all farewell- I have many a blog to visit, but as of now I am going to go visit my comfy bed and get my energy level back up so I can take care of a baby! These are cute...I made headbands that looked similar. I love crochet treasures!! 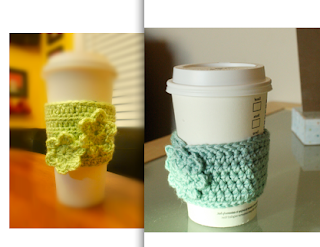 I need one of those cute coffee cozies - LOVE! Awww, don't get the "baby itch" after holding that precious little thing! Those are super cute!!! I can't wait to find out who I get so I can make something. I have a few ideas, but have to see what their favorite color/style is. It's baby mania around here. Two of my friends had babies yesterday. One had a boy (10 lbs 11 oz!!!!) and the other had a girl. Another friend is due any time now. Your talented! I have no idea how in the world you made that. WOW! Babies -- they are very cute when they belong to other people! Super cute! I don't drink coffee but it could even be cute around a soda bottle, right? :) Have fun with the baby- I'm pretty baby crazy right now so I'm jealous! I love it! I would so buy one of those. I can't even knit on the children's loom. And I don't think I have ever even typed the word, loom. Well, that increased the excitement factor in my day one hundredfold.